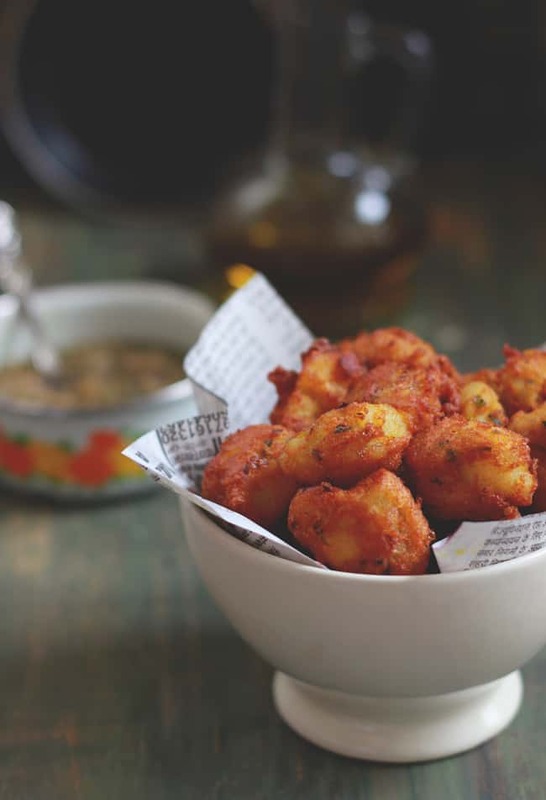 Aloo Ki Fulori is a gluten-free potato and gram flour fritter with the addition of buckwheat flour. It is a 100% vegetarian snack without any onion or garlic. These fritters are crisp, crunchy and addictive; you can’t stop at one or two pieces. And they have enough edge to compliment the green chutney and a cup of masala chai. 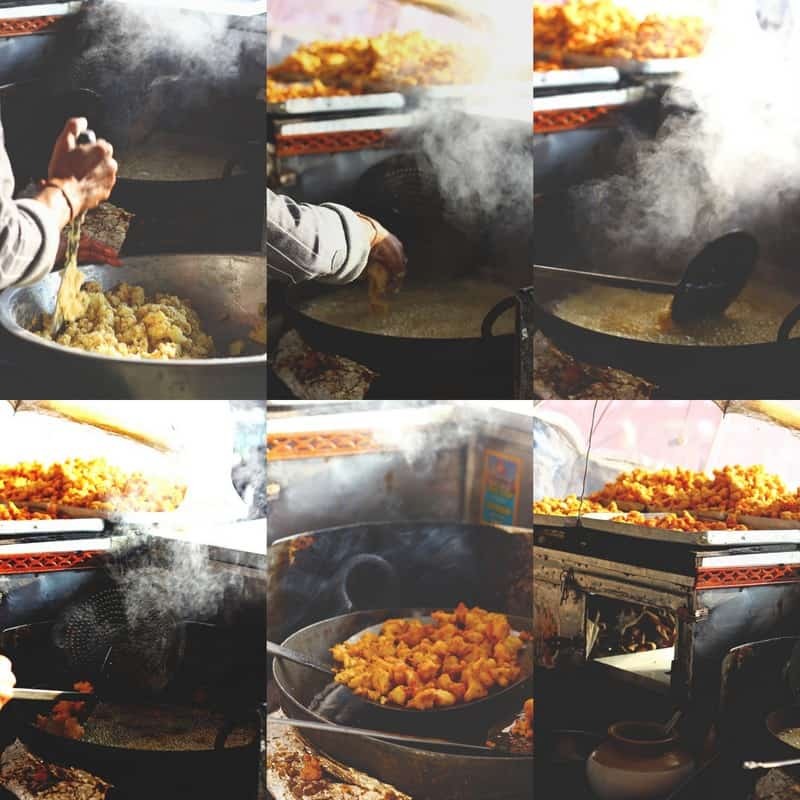 If you have traveled across the old towns in north India then somewhere by the roadside, a food cart selling ‘fulori’ might have caught the attention of your food senses. Fulori is the regional term for fritters prepared with the vegetables and gram flour. 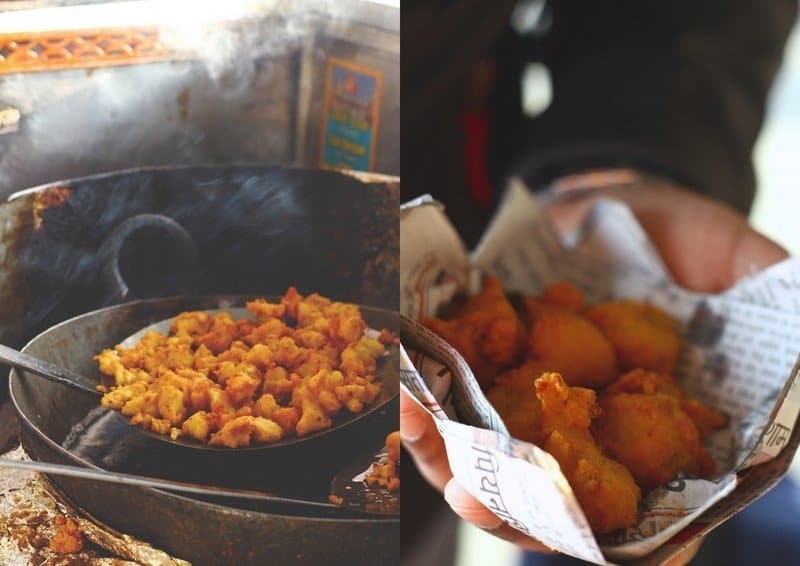 Batter-coated vegetables or potatoes, popularly known as pakora, accompanied with chutney and a cup of tea are one of the popular snack bites in most parts of the country. How is aloo ki fulori any different from the regular aloo pakora? To my knowledge, fulori is prepared with a combination of different flours, vegetables and is generally crunchy bite-size snack. 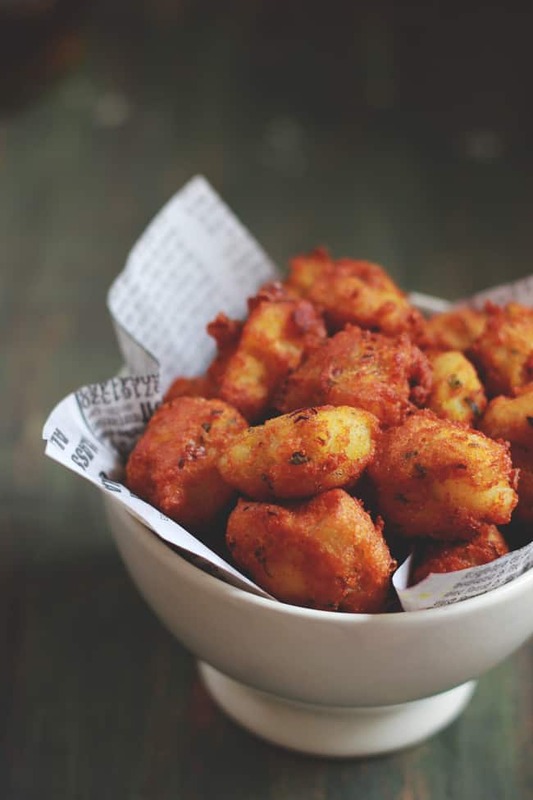 Whereas, aloo pakora is made by dipping round slices of potato in gram flour batter and then deep-fried. In simple words, both are two different ways to enjoy the goodness of deep-fried potatoes for teatime snacks. Deep-frying is my least favorite method of cooking. But once in a while, I give up to those guilty pleasures and indulge in snacks like aloo fulori. And I am always ready to make an exception for delicious festive snacks like these delightful potato fritters. 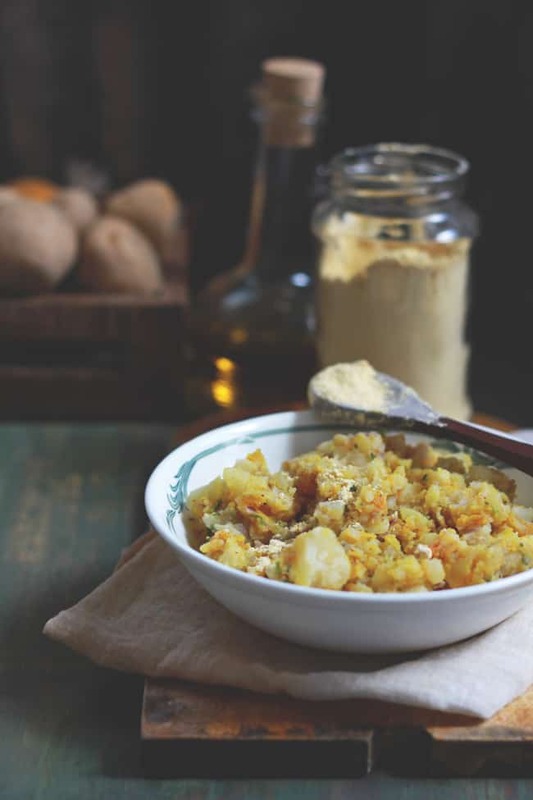 I learned this aloo fulori recipe when we were enjoying a countryside lifestyle in the midst of the Kumaon hills. At the railway station in our town, there used to be one tiny food cart selling these coin-sized fritters. Though the fritters looked extremely inviting, initially, we stepped back from tasting them due to obvious hygiene reasons. 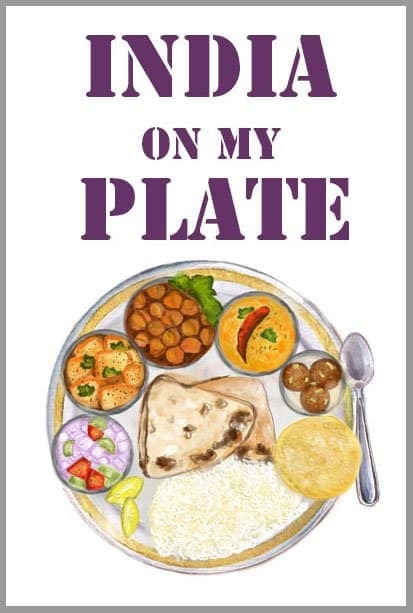 Then one day I gave up to the goddess of greed and bought a plate of aloo ki fulori. It was not even a plate; he sold them on a piece of newspaper with a lump of chutney on top. And after one bite we couldn’t resist the fixation for the fulori. I took inspiration from what I could understand from the taste and texture of the fulori at that small street cart and came up with this recipe. Mine is a bit manicured version of fulori while the one sold at the roadside has a rustique appeal to it. Later, after discussion with many other food lovers, I learned that fulori is enjoyed in many cities of India as a snack. And has different regional names – aloo pakora, aloo fulori, fuluri, phuluri and many more. If you also happen to know another regional name of this dish, please share with us in the comment section. How To Make Aloo Ki Fulori For Fasting? For any typical fasting meal, these potato fritters are a great snack. Or on certain festive occasions when one can partake only vegetarian meal these aloo pakora add variety to the menu. If you are preparing them for the fasting snack, then abstain from adding – onion, garlic, turmeric, gram flour, mustard oil and the regular salt (instead used rock salt). All you need to do is combine boiled potato with buckwheat flour (kuttu atta), spices, rock salt, fresh coriander, and green chili. Combine the ingredients nicely as suggested in the recipe. Then deep fry in the ghee (clarified butter) till crisp and golden from the outside and fully cooked from the inside. Serve them with farali (vrat) chutney of your choice. 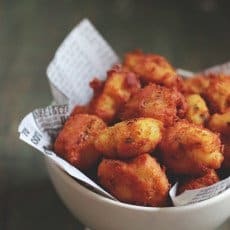 If you want to serve these as vegetarian snacks for celebratory occasions like Diwali or Holi, then follow the aloo fulori recipe I have shared as it is. And don’t forget to share with us how you like them! Aloo Ki Fulori is a gluten-free potato and gram flour fritter without onion/garlic. Learn how to make Indian style potato fritters in a few simple steps. First, boil the potato in a pressure cooker for 2 whistles over medium heat. We do not require fully boiled and mushy potato. Potatoes are to be just cooked through with a firmness to them. Peel the potatoes and allow them to cool so that they become easy to handle. Transfer boiled potato in a bowl. Add flours, spices, salt, coriander, and green chili. Now try to break the boiled potato into bite-size chunks using your fingers. We are not looking for any perfect bite-size pieces, roughly mash the potatoes and other ingredients together. Do not mash potatoes for too long or too hard. Once all the ingredients combined well, stop mixing. Heat oil in a deep frying pan ( buy it here ) over medium flame. Once the oil reaches smoking point reduce the heat to low. Now pinch a coin-size or little bigger portion of the potato mixture and slide it into the hot oil. Don't bother much about the shape of the fritters. Use tip of your fingers to pinch a portion and then to drop it into the frying pan. Fry aloo fulori in small batches till crisp and golden from all the sides. Transfer fried Fulori into a plate lined with paper towel to absorb the excess oil. Serve Aloo Ki Fulori hot sprinkled with chaat masala along with green chutney ( see recipe ).